Iranian Supreme Leader admits talks with 'Satan' US are for expedience to relieve pressure and deceive, using Islamic taqiyya tactic. 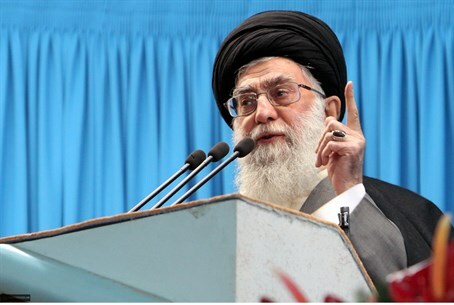 Iranian Supreme Leader Ayatollah Khamenei publicly revealed on Thursday that negotiations with the US about Iran's nuclear program are part of a tactic to stall international pressure and gain time. "We had announced previously that on certain issues, if we feel it is expedient, we would negotiate with the Satan (the US) to deter its evil," said Khamenei in Qom. He further claimed "the nuclear talks showed the enmity of America against Iran, Iranians, Islam and Muslims." The statement comes after negotiations ran into rough waters this Wednesday over a dispute regarding Iran's desire to develop new highly advanced centrifuges, in opposition to the November 24 deal prohibiting new centrifuges. Officials from both sides are reportedly meeting for two days of discussions to try and bring talks back on track. Al Arabiya reports that Khamenei's statements are tantamount to a confession of employing the Islamic deception tactic of "taqiyya," a strategy of concealing one's beliefs or intentions at a time of danger to create later opportunities. The Arab media source defines the tactic as "a form of dispensation with religious principles when people are under threat or persecution." As early as 2008 analysts were saying talks between Iran and world powers over the controversial nuclear program were nothing more than a taqiyya ploy. Khamenei's referral to the US as "the Satan" echoes Ayatollah Ruhollah Khomeini, leader of Iran's 1979 Islamic Revolution. Rampant hatred of America was on display in Iran last November during the annual "death to America" day, revealing the intentions behind Iran's taqiyya approach. This not-so-hidden message we reiterated Monday as an Iranian lawmaker declared that "having a nuclear bomb is necessary to put down Israel." Despite the blatant statements revealing the intentions behind Iran's taqiyya, Iranian President Hassan Rouhani's "charm offensive" has been considered highly successful in removing the pressure off the Islamic state and instead isolating Israel.